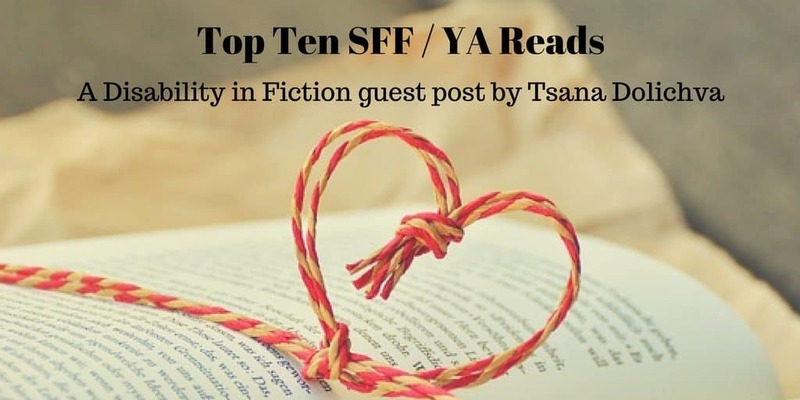 Today I’m really happy to welcome Tsana Dolichva to the blog with this guest post on her top ten Speculative Fiction / YA reads featuring characters with disabilities or chronic illnesses. I reached out to Tsana about this post after reading (and falling in love with) Defying Doomsday, which Tsana co-edited along with Holly Kench. If you’re interested, I just kicked off a read-along of Defying Doomsday – feel free to pop over and check it out (and join!). 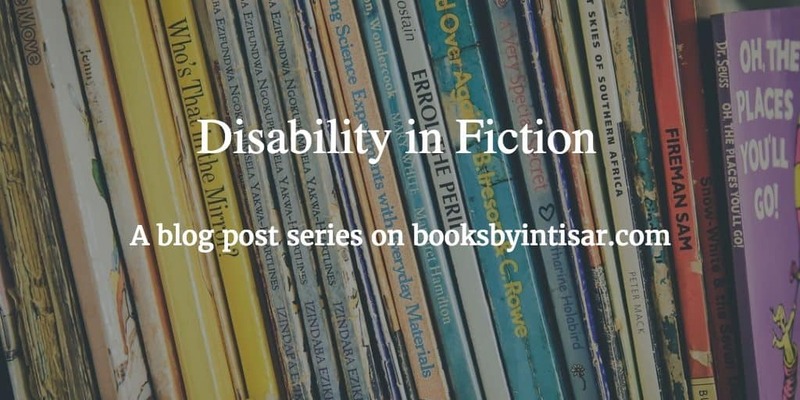 When I started writing this post, I didn’t think I’d read ten books with disabled or chronically ill main characters. They are books that are few and far between, but thanks to a list I’ve been keeping since we started working on Defying Doomsday, I had more than enough books to choose from. That said, this list isn’t supposed to be the ultimate list of best books about people with disabilities and chronic illnesses. I haven’t read every book out there and for this top ten I’m only drawing from books I have read. I’m sure there are others I haven’t gotten to that deserve to be on this list (indeed, there are a few in my TBR pile that I’ve been promised are excellent). I’ve gone for the best that I’ve read, in terms of both representation and writing quality. They are listed in roughly descending order and I’ve included links to my full reviews of each book if you want to read more details about the plots and so forth. Also, be warned, some of my comments about the books listed below may be spoilers, especially when the representation becomes more relevant later in the book or in a later book of the series. On the Edge of Gone by Corinne Duyvis is a YA novel set in the same world as “And the Rest of Us Wait”, her story in Defying Doomsday. 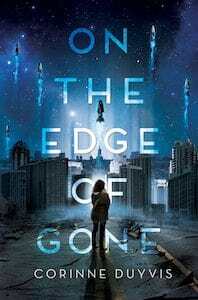 On the Edge of Gone is narrated by an autistic teenage girl living in Amsterdam immediately prior to and during the time an asteroid hits the Earth. It’s mainly about her surviving, trying to keep her mother and sister safe, and dealing with the people she meets along the way. The Rest of Us Just Live Here by Patrick Ness is a YA contemporary fantasy novel about a group of teens in small town USA. The narrator has convincingly portrayed OCD and anxiety and a key secondary character, the narrator’s sister, is recovering from anorexia. Otherbound by Corinne Duyvis is a YA portal fantasy featuring as protagonists a boy from Earth who lost a foot when he was younger and a girl from the fantasy world without a tongue. Several of the secondary characters from the fantasy world also don’t have tongues and all speak using sign language. 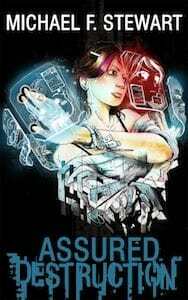 The Assured Destruction series by Michael F Stewart (Assured Destruction, Script Kiddie, and With Zombies) is a contemporary YA series I picked up without any expectations of disability etc representation. But the teenaged protagonist’s mother has MS and is in a wheelchair, which was realistically presented in the context of the protagonist’s life. Throughout the series her mother’s health waxes and wanes and in the third book we additionally see the main character suffer from acute stress disorder herself (again, very realistically, given the events in the book) and spend some time in hospital because of it. The Children of the Black Sun trilogy by Jo Spurrier (Winter Be My Shield, Black Sun Light My Way, and North Star Guide Me Home) is a grimdark fantasy series in which one of the key characters (there are several point of view characters) deals with chronic pain from chronic injuries. The final book also deals with amputation and its aftermath, including cognitive impariment due to blood loss in a world without transfusions. 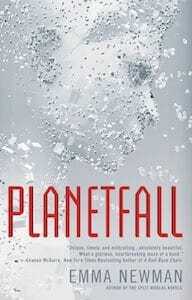 Planetfall by Emma Newman is a science fiction novel featuring a main character with a mental illness. She’s the narrator, so it’s not immediately obvious to the reader based on what she tells us (I also love an unreliable narrator), but it comes out in the course of the book that’s she’s a severe hoarder. It’s also the only book I’ve read focussing on that particular condition. Dangerous by Shannon Hale is a YA superhero novel (it has aliens and magic, classify it how you will) featuring a main character who has only one hand. The story is heavy on action and adventure and saving the world. As far as representation goes, the main girl does get a robotic arm with pretty magically advanced technology, so it’s not perfect and bordering on the magical cure trope. 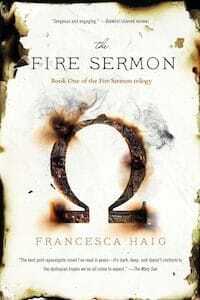 The Fire Sermon by Francesca Haig is a post-apocalyptic dystopian novel in which everyone is born with a twin. One twin has some sort of physical deformity and is forced to live life as an outcast, while the other is “normal” and allowed to be part of the proper society. The main character is not disabled, but the main secondary character has only one arm and there are many minor secondary characters with various disabilities. The nature of the society allows for much commentary on the disabled experience and their exclusion from society, including dealing with the social model of disability. The Newsflesh trilogy by Mira Grant (Feed, Deadline and Blackout… and now a fourth book about other characters that I have yet to read) isn’t perhaps the most obvious choice for disability representation since it is a series set post-zombie apocalypse. The medical stuff behind zombism is fictional, but some aspects lead to conditions analogous to real life issues. In particular, one of the main characters — who are a group of journalists covering a US election campaign trail — has light sensitivity which means she wears sunglasses most of the time and is frequently inconvenienced in her day to day life because of it. 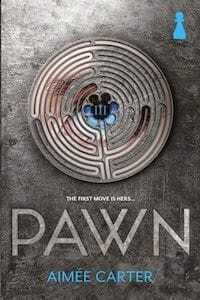 The Blackcoat Rebellion trilogy by Amiée Carter (Pawn, Captive and Queen, the last of which I haven’t read yet) is a YA dystopian trilogy featuring a dyslexic main character. I liked the representation of something I haven’t seen in many books. I will note, though, that after the beginning of the first book it was often brought up for plot reasons more than anything else. A huge thank you to Tsana for sharing this awesome list of reads. I am really looking forward to them! If you’re looking for even more books, be sure to also check out the Disability in Kid Lit Honor Roll. Tsana Dolichva is an astrophysicist and a science fiction writer originally from Melbourne, Australia who travels a lot. When not writing, reading or blogging, she studies dying stars. You can connect with her on Twitter, Tumblr, or through her website. Unfortunately, I rarely see deaf people represented in fiction. And I tell you from my own experience, it is a quite special form of disconnection (also, a basis for some nice superpower as well). I would love to read a deaf main character who was well-portrayed in fiction! I was actually really excited about the release of Soundless by Richelle Mead, only to read the reviews by various sites that discuss disability representation and find out that it was severely lacking in a variety of ways. I didn’t end up picking it up, but I’m still on the lookout for such a book! Thanks so much for stopping by. This is wonderful! I just recently started a list on my blog of sci-fi/fantasy books with disability, and I just came across this post while looking for more to add. I didn’t know about some of these! I also just came across a post on one of the blogs I follow about your read-along, and I love how you’ve actually created questions and everything! All the sudden there’s all this stuff going on to bring attention to disabilities in books (#DisabilityDiaries2017 is also happening this week), and that makes me so happy. Yay and welcome! So glad you’ve found some new reads here–I’m very excited to dive into these myself. 🙂 And yes! The read-along is so much fun. I’m actually trying to figure out the questions for tomorrow’s post right now (ack!). If you’re tempted, please do join! Since it’s an anthology, they’re short stories and it’s easy to jump in wherever you like. I hadn’t heard of #DisabilityDiaries2017 – I will definitely have to check it out. Thanks for putting it on my radar! I’ve been trying to follow the monthly #CripLit chats on Twitter and have found out about of lot of new and forthcoming works through the authors there. I think that, given the repeal of the ACA (here in the US), the disabled community needs everyone’s support right now. I’m really glad for the push to promote disabled voices and stories, because I really believe that it’s through stories that we build empathy and compassion, and that’s what we most need. I’ll get off my soapbox now! 😉 Thanks for stopping by and commenting! Have you heard of the Vorkosigan Saga, Intisar, by Lois Mcmaster Bujold. It consists of at least 16 novels and several novellas. The main character, Miles Naismith Vorkosigan, has brittle bones and other medical problems, caused in vitro when his mother breathed in some poisoned gas. He doesn’t really appear as the main character until book 4, The Warrior’s Apprentice. The first books in the series were published in 1986 but it is a series that you can read and re-read.